My last experience buying salsa shoes was a disaster. I had gone to Champion Dance Shoes in Burbank and carefully selected the size, style, and fit, thinking I had scored the perfect pair. But after my first night out on the dance floor with them, my feet ached with blisters. It was a good week before I could put on closed shoes again comfortably. I appealed to the shoe shop for an exchange, but alas, since I had worn them once, no return or exchange was possible. This wasn't just a matter of "breaking them in"; subsequent attempts to dance with the shoes resulted in equally miserable results. But I had paid $150 for them and refused to shell out for a new pair right away. I posted ads on Craigslist and at dance studios, but no one would take the things off my hands. One bad shoe purchase ended up derailing my salsa adventures for nearly three years. Every time I thought of going dancing, I lamented the shoes and opted not to. I diverted my energy into other forms of dance that didn't rely upon specialty heels. My boyfriend during this period wasn't a dancer anyway, so for a time I put my salsa desires away with the shoes, in a box in the back of my closet. But a recent break-up and entrance into the dating world again had me jonesing for a salsa fix. I decided I was finally ready to shell out a chunk of cash for a new pair of shoes. I gave the old pair away to a friend and set out to find shoes that would finally work for me. I trolled the city from Pasadena to Hollywood, but couldn't settle upon the right pair. A friend suggested that I look online for the best selection and best deals. I felt wary. If I couldn't try them on in person, how could I guarantee that my purchase wouldn't be a repeat of last time? Then I remembered that choosing the shoes in person hadn't been any guarantee of comfort. Why not give it a try? I went to OnStageDancewear.com, an online site devoted to dance gear of every stripe. 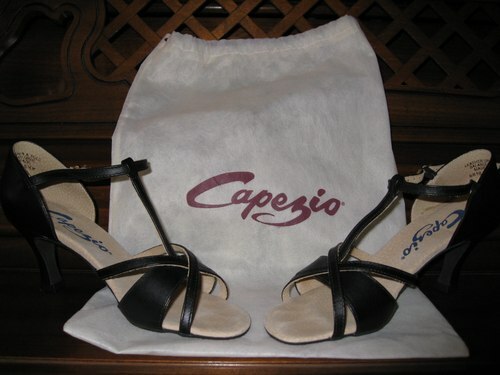 The selection of ballroom shoes was so much broader than anything I'd seen at brick-and-mortar stores, with a range of styles from Capezio and Freed. Scrolling through the choices, my eye settled on a strappy Capezio Latina shoe that I had seen in person at one of the stores I previously visited, but the store didn't stock the size and color I wanted. OnStageDancewear.com had the perfect combination of style, color, and size. And the shoes were $20 cheaper than at the store! I took a deep breath and clicked "purchase," surrendering my salsa fate to the electronic gods. Everything worked like clockwork: the shoes arrived exactly when they were supposed to, and the order was correct. Now it was time for the real test. Would the shoes fit? Would they support me—instead of wound me—on the dance floor? For the pilot run, I went to Sunday night salsa at Steven's Steakhouse in Commerce. It was a particularly packed night, since the following day was Veteran's Day holiday. With a group of friends, I watched the action on the floor for a good hour before I ventured into the mix. I felt rusty and tentative; my shoes felt green. I had to break myself and my heels in. Finally, I was invited to dance. As my partner lead me into my first twirl, the soft new bottoms of the shoes slid over the dance floor like butter. Smooth. My partner? Not so smooth. He jerked me around and, out of practice, I just couldn't follow well. I went through about five partners that night and with each one it was the same: selfish dancers more concerned with showing off than guiding their lady. I felt like I had dived into a pool of sharks. I couldn't find a groove with any of them. But my shoes were the saving grace of the night. Even with all the bad leads, false starts, jerky turns, and near collisions, my shoes remained steady and supportive. I left that night without a true salsa fix. But at least I went home with nary a blister.